Those who are consider punctuality is very important thing, this bathroom vanity collections from Ellebi might be a great additional touch to their bathroom. With a cosmetic clock hand handles, with this bathroom furniture, you can always know the time, avoid being late for young professionals. Smart idea of placing wall clocks near the time vanity and cabinets, it’s like saying this is bathroom vanity clock style. Available in different colors and styles, wall-mounted or free-standing. Wood bathroom vanity from Mariner designed with natural and crafted materials. If you are creating a natural look for you bathroom, you can choose this bathroom vanity to complete it. The curvy forms highlight the innate grain of the wood. As you can see in the pictures below, some of the bathroom vanity are using bands of different woods, looks beautiful in harmony. The modern and clean look should make perfect combination for your contemporary bathroom. TwinLine Tub Shower is perfect for modern bathroom, especially if you have small space but wanting to have a shower and a bathtub. The clear glass door offers an intriguing underwater glimpse when you are bathing. Stone bathtub from Maxim delivers classic bathroom interior design. Combination of the ash wood and the stone gives weightless to the overall look. The starkness of the material and sharp rectangular construction is made welcoming to the bather with a coordinating pale ash backrest, which can be easily adjusted to the desired position. Decoring a wood theme bathroom? Try to consider wood bathroom vanity from lacava. Bathroom vanity from lacava gives you full range of wood options and sizes from a simple sink stand till dual sink model with cabinets. This wood bathroom vanity collection from lacava gives you clean and modern selection of bathroom vanities. But not only that, the collection also includes classic selections which consist of bathroom accessories, bathroom toilets, bathroom sinks, bathroom faucets, and bathroom showers as well. 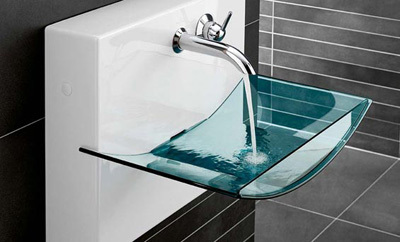 First impression of this bathroom sink basin, wow … you get the feeling of fresh air. The combination of glass and ceramics really gives the impression of futuristic. The glass bowl is really eye catching, the clean lines of this piece and put it on top of the tile is really a brilliant idea! Stylish: the installation is concealed from view within the rear panel, making it possible to select a wall-mounted tap fitting and outlet without the need for structural work in the bathroom. This faucet from Frisone is designed as if the water is flowing just like waterfall. You can experience the magic waterfall everyday using this faucet bathroom designs. The beauty of water can draw your attention, this faucet allowing the water to fall gracefully, calm and inspire, enhance your bathing experience with waterfall faucet from frisone. 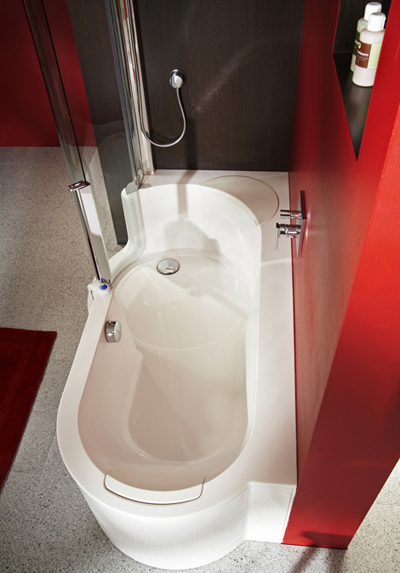 Contemporary Bathroom from Disegno Ceramica is having a smooth and gently rounded shapes. If you want to create a bathroom that giving sense of harmony, try use these products. You can have bidet, toilet and sinks that are so eye-catching. Suitable for anyone with sophisticated styles. Using high quality materials, the kubik contemporary bathroom from Milldue gives you simplistic, minimalist bathroom interior design. Explore those gorgeous sink, curving faucet shows you that well-equipped bathroom can also stripped-down style. Perfect combination of the drawers and handles that do not disturb the contemporary units.